Description: "This is a set of high quality sand hourglass timers 1min 3min 5min 10min. They are very durable and shock-resistance. Perfect for timing cooking, games, exercising, experimentalize and so on, which can help your kids understand the concept of time by this visual angle. The multicolors also can make your home more cozy. A quite great gift for your kids and friends. " Features: ▪ Color: 4 different colores. ▪ Material: Durable PVC, high borosilicate glass and Sand. ▪ Size: About 3.7×1.6 inch each one. Weight: 2.4oz. ▪ Counting time: 1 minute, 3 minutes, 5 minutes, 10 minutes, each colored sand timer with 10% time deviation. ▪ 100% brand new and high quality Colorful Hourglass Sandglass Sand Clock Timers. Package Including: ▪1 X 1 Minute Hourglass Sand Glass Timer ▪1 X 3 Minutes Hourglass Sand Glass Timer ▪1 X 5 Minutes Hourglass Sand Glass Timer ▪1 X10 Minutes Hourglass Sand Glass Timer NOTICE:This sand timer is mainly made for games,which is not a precision timing device, so there is time deviation,please kindly understand. Always feel distracting to use your mobile phone to time? Always feel whiny when you doing things non-efficiently? 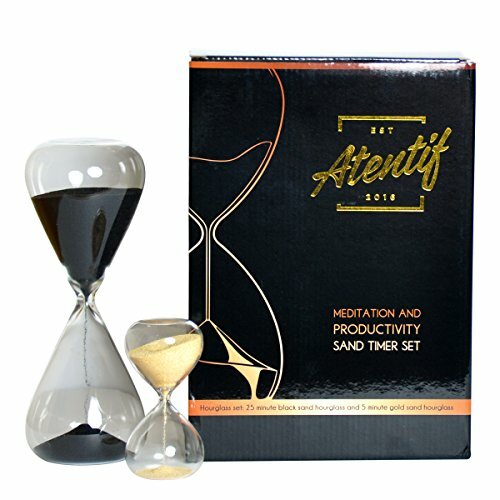 ☞ Using these colorful sand hourglass timers including 2min and 20min timers can help solve all your troubles. Not only help you do things efficiently, but also can teach your kids about the time meaning, What's more, Perfect for timing cooking, games, exercising, experimentalize and kids study, Their multicolors also can make your home more unique. A quite great gift for your kids and friends. " Unique Features: ▪ Color: Orange & skyblue. ▪ Material: transparent Acrylic + Plastic + Glass Tube + Sand. ▪ Size: 5.1''X 2.2'', Weight: 3.5 oz. ▪ Counting time: 3minutes, 15 minutes, each colored sand timer may be with 10% time deviation. 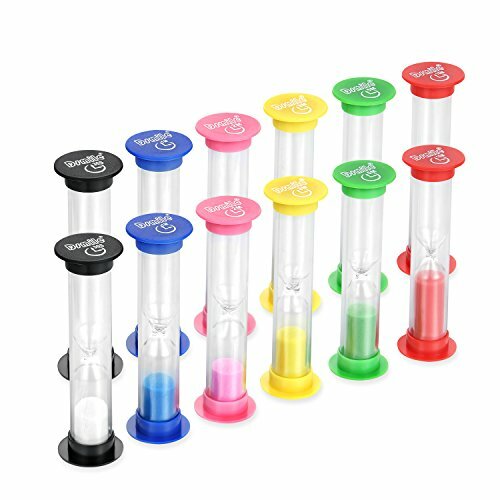 ▪ 100% brand new and high quality Colorful Hourglass Sandglass Sand Clock Timers. 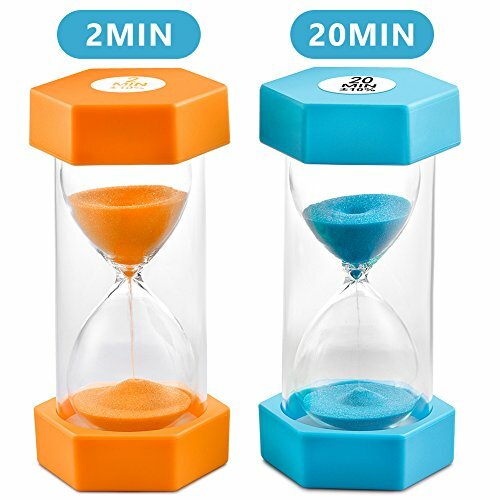 Package Including: ▪1 X 2 Minutes Glass Sand Timer ▪1 X 20 Minutes Glass Sand Timer NOTICE: Sand hourglass timer may be ±10% time deviation, Not a complete precision timing device. 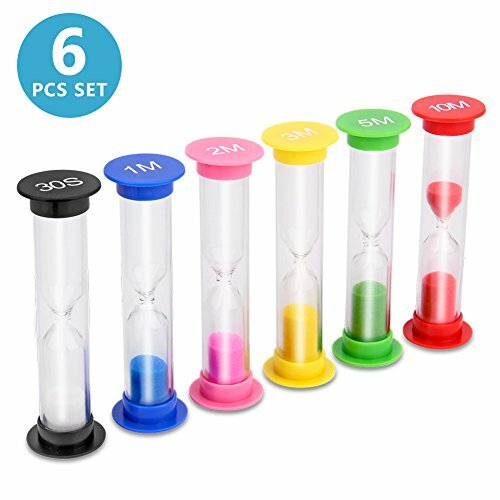 The item is a set of 6piece hourglass sand clock timers in different colors, which includes one 30 second sandglass, one 1 min sandglass, one 2 min sandglass, one 3 mins sandglass, one 5 mins sandglass and one 10 mins sandglass and is made of durable plc, abs, glass tube and sand materials. They are perfect for timing cooking, games, exercising and so on and also a wonderful decoration for your home and office. Features: Brand: Fox novo. Color: 6 different colors. Material: Durable plc, abs, glass tube and sand. Each size: About 8.52.5cm. Counting time: 30 seconds, 1 minute, 2 minute, 3 minutes, 5 minutes, 10 minutes, each one with 10% time deviation. 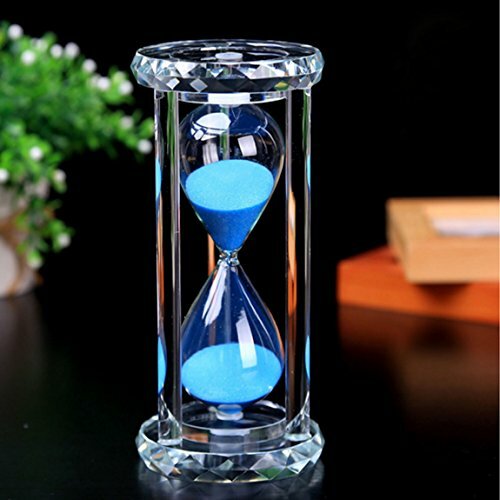 100% brand new and high quality colorful hourglass sandglass sand clock timers. Ideal for timing cooking, games, exercising and so on. Also act as a wonderful decoration for your home and office. Note: This is a sand timer made for games. It is not a precision timing device, so there is time deviation. 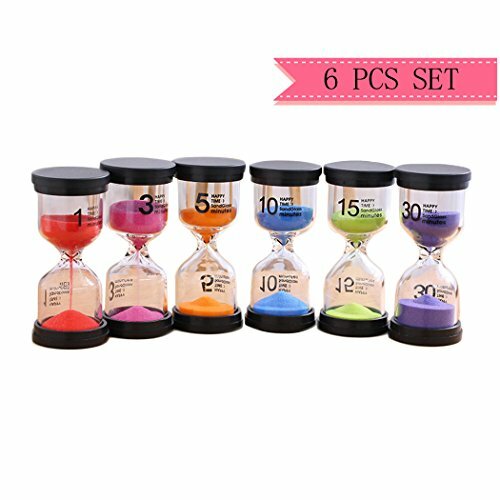 Package including: 1 30 seconds hourglass sand glass timer, 1 1 minute hourglass sand glass timer, 1 2 minute hourglass sand glass timer, 1 3 minutes hourglass sand glass timer, 1 5 minutes hourglass sand glass timer, 1 10 minutes hourglass sand glass timer. Always feel frustrated to use your mobile phone to time? Always feel helpless when see your kids quickly brush teeth within 1 minute or doing things inefficiently? 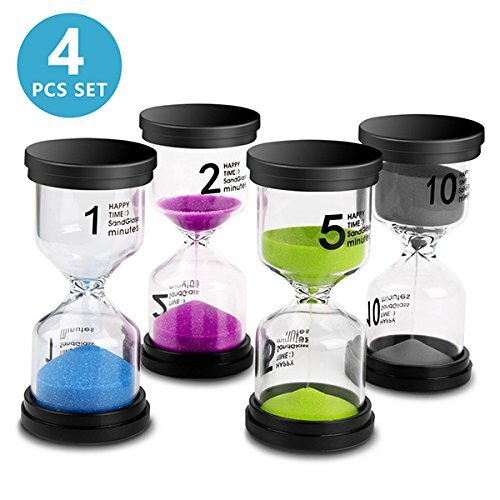 "☞ Using this set of colorful sand hourglass timers including 1min 3min 5min 15min. One set can help solve all your troubles. Using these timers with your kids together, not only can teach your kids about the time meaning, but also promote feelings with children. What's more, Perfect for timing cooking, games, exercising, experimentalize and so on, Their multicolors also can make your home more unique. A quite great gift for your kids and friends. " Features: ▪ Color: Blue, Pink, Green and Gray ▪ Material: Durable PVC, high borosilicate glass and Sand. ▪ Size: About 3.7×1.6 inch each one. Weight: 2.6oz. ▪ Counting time: 1 minute, 2 minutes, 5 minutes, 10 minutes, each colored sand timer may be with 10% time deviation. 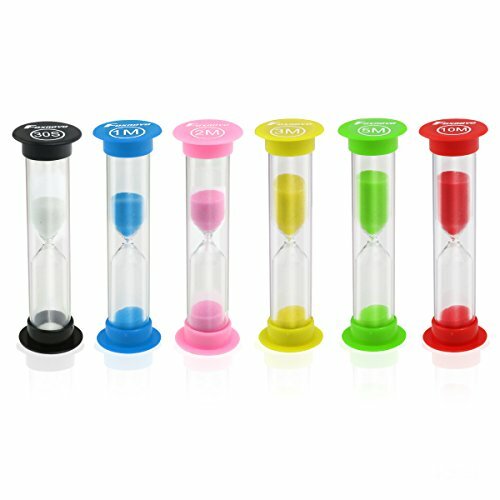 ▪ 100% brand new and high quality Colorful Hourglass Sandglass Sand Clock Timers. 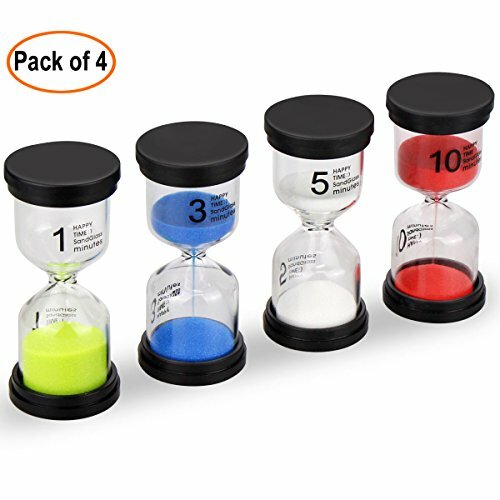 Package Including: ▪1 X 1 Minute Glass Sand Timer ▪1 X 2 Minutes Glass Sand Timer ▪1 X 5 Minutes Glass Sand Timer ▪1 X10 Minutes Glass Sand Timer NOTICE: Sand hourglass timer may be ±10% time deviation, Not a complete precision timing device. Features --Colors: 6 different colors. --Materials: durable PVC --Counting timer: 30 seconds, 1 minute, 2 minute, 3 minutes, 5 minutes, 10 minutes --Ideal for timing cooking, playing games, exercising,reading,quizzing and brushing teeth for kids. --Also act as a wonderful decoration for your home and office. Note This is a sand timer made for games and it is not a precision timing device, so there is a time deviation. Instruction and Features: Color: Blue, Purple, Pink Size: 6.7'' * 3.15'' Material: Crystal Glass, Sand Time: About 30 Minutes Packing: Exquisite gift box packing Kindly Attention: *Please put these hourglass in a safe and flat place and keep away from children's reach. *The sands may gets stuck if the environment humidity gets too high, try to put it in dry and safe place for 1-2 days. *There may be a little color difference compared with the posted pictures, it's not the quality problem, but the craftsmanship when being manufactured. *These sands timers are designed for games, decorations, souvenirs, not a precision timing device, so may be a little time deviation. Meanwhile, sand flowing speed can be affected by temperature. 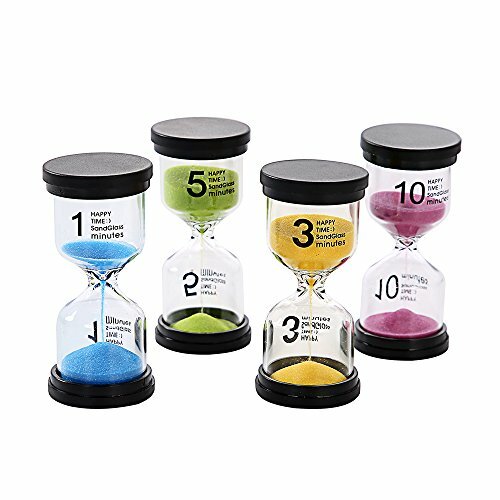 Compare prices on Sand Timer Clock at ShopPlanetUp.com – use promo codes and coupons for best offers and deals. We work hard to get you amazing deals and collect all available offers online and represent it in one place for the customers. Now our visitors can leverage benefits of big brands and heavy discounts available for that day and for famous brands.